We arrived early enough for a beer and the biggest pizza ever shared by two and, once we had our nasty little tickets in our sweaty hands, we ambled up to the stage and picked out a comfortable spot about 5 people back from the rail and started gently bobbing to the crazy, improvised sounds from Pedro’s music contraption – a mashup of MIA, samba beats and the sound track of a horror movie by Salvador Dali – animated by Chairman Mao’s sexiest concubine. Boiler suits were never so hot. Gradually, the beats got louder…and… closer!? It was Stomp Meets Cirque Du Soleil and GB’s warmup band were performing in the middle of the crowd. Their throbbing conga line encircled us and eventually pushed us aside, performing most of their set practically standing on our toes. 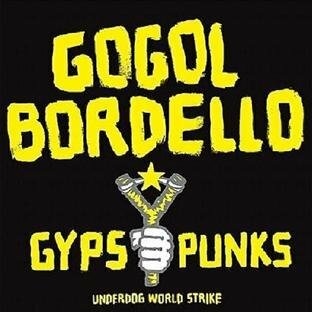 After a few false alarms, the teeming multitude which is Gogol Bordello swarmed onto a stage barely able to contain them. I haven’t pogoed for twenty years but tonight I had no choice but to bounce along with the rest. In just a handful of measures, my fellow pogo-ers – a mixed bunch of young couples, college girls and a few other oldies – had been displaced by hordes of violent youth and suddenly it was Thermopylae and we were the Spartans fighting for our very survival. By now, I was 30 feet back from the stage and being battered from every direction. Frenzy doesn’t begin to describe the sensation until the enemy added a new direction of battering when a very large man landed on my head – the crowd surfing had begun! The surfers – more Gimli at Helm’s Deep than Brian Wilson at Malibu – continued their crazy violence throughout the show but that first surfer, in a wild swipe, grabbed at the crowd taking my glasses and bandana in one greedy handful [note to self. wear contact lenses next time.] My bandana was lost but I grabbed my twisted spectacles back and stuffed them into my pocket. Two tracks in and I was starting to doubt my stamina. I didn’t expect to last the night but my jostling neighbours jostled me back up to the front and I enjoyed the rest of the concert in relative calm just two bodies back from the rail and just four feet from Eugene and his band of manic troubadours. 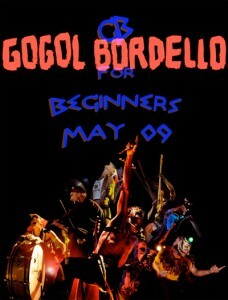 Gogol Bordello are the band that Peter Greenaway and Monty Python might’ve conjured up after an acid flashback. Dexy’s Midnight Runners meets The Pogues meets Guernica. Even their ballads are played with an intensity more appropriate on a battlefield. Despite a couple of weeks of cramming on Rhapsody, I only know a handful of their songs but every track was an old favourite tonight. I screamed the obscenities along with the rest of them. The highlight of course was Start Wearing Purple and this video barely captures the insanity. Like Dumbo’s dream, like Pooh’s Heffalumps and Woozles, like Dali’s telescopic elephant legs, like Lear’s Jumblies, the song conjures up juggling midgets and bearded circus ladies and organ grinders on meth. Now I feel I was there…thank ye. Beautifully said. I got from exhausted from moshing to GB last night, than I used to from bands 20 years ago. That proves GB is better right? So freakin’ awesome! Thanks for posting. Now THAT is what I expect of my friends. Rock on. Nice writeup. I wish I had been there. 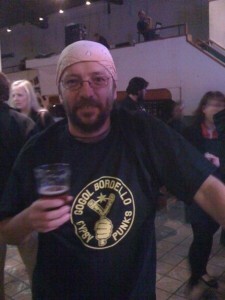 No one slam dances in Santa Cruz at shows, it seems like mandatory fun at a Gogol Bordello show. Maybe they should play Santa Cruz. Did I mention it was in santa cruz at The Catalyst? What? When? Holy crap! I am so sad now. I have seen a couple of shows there and was always disappointed by the mellow-ness when I was ready to jump out of my skin for joy. That’s great — nice place to see a show too.